He’ll have someone’s eye out! All the best of the day’s celebrity dirt. Try not to look directly at it! #BIG WILLY STYLE Reports from the Mad Men set indicate that Jon Hamm – the actor who plays Don Draper – has almost had a few people’s eyes out with his… ahem… manhood. 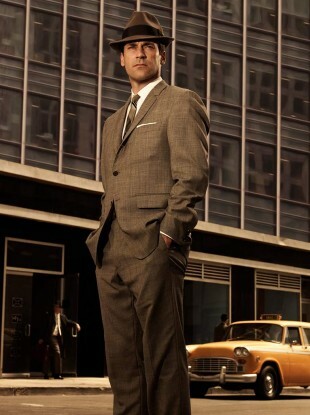 His manhood was so apparent in the promotional material for the earlier series of Mad Men that Photoshop was needed. #GIRLS NOT ALOUD Are Girls Aloud no more… again? Dear Alouders, we just want to say from the bottom of our hearts Thank you!! This tour has been an amazing experience and the perfect chance to say thank you for being on this journey with us through a decade. It has far exceeded any of our dreams and we hope we are forever your inspiration and reminder that dreams really do glitter!! Your love and support will stay with us forever but we have now come to the end of our incredible time together . Love you lots. Nadine ‘What Date of Birth Did I Say?’ Coyle has also been tweeting about crying on stage for the past few nights, but that they have been tears of happiness. How glad is she that she got that date of birth wrong, huh? #PRETTY IN PUNK Molly Ringwald – she of The Breakfast Club and Pretty in Pink fame – has an album out. Except… Sometimes features the famous redhead’s take on some jazz classics. Sure, but can you still do that trick with the lipstick Mols? Email “The Dredge: Don Draper's willy is causing all sorts of problems ”. Feedback on “The Dredge: Don Draper's willy is causing all sorts of problems ”.